You work with people and often that “something else” which defines your industry and unique business. Project blogs offer a versatile workspace for teams to record and track that special something eg. Projects, Properties, Portfolios, Locations, Cases, Jobs, etc. Change the system default label of “project blogs” to something more specific to your business for a tighter and more personalized system. Share these blogs with your team, or publish them to collaborate with anyone outside of Solve. Solve’s import tool offers a simple method for importing new contact and company records from almost any other system, or mass updating your existing data through an array of formats, including .CSV and Excel files. 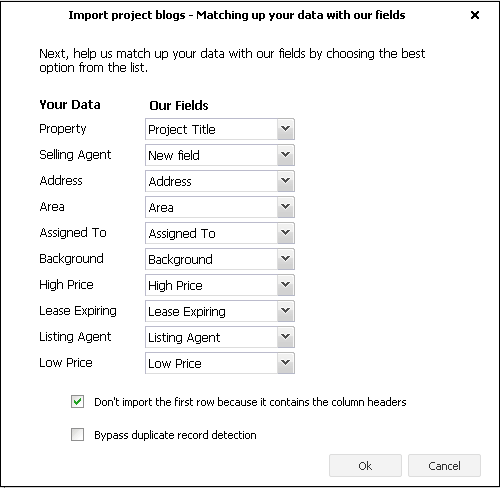 Solve now extends the ability to import .CSV and Excel data into project blogs, just like the contact and company import. Easily import your project, property, portfolio or similar records into Solve. You can even import category tags to classify your data as you add it into Solve. It’s a handy way to get started quickly.